Set against a fabulously eerie, isolated backdrop, this distinctive short has a suitably haunted Michael Lorz as a tired, pallid young man working tirelessly at the eponymous location while his vintner family decline. His father is unsympathetic and overbearing, while mother is very sick and bed-ridden. Lorz sees an opportunity to ease her suffering when a visiting mother and son from Montrael turn up to taste the wines. Writer-director Munz-Maire carefully establishes a deeply troubling dysfunctional family set-up before delivering some startling gore (“Find the artery…”) and excellent make-up effects. With a fascinating family dynamic and a vividly realised sense of location, there is much here that would warrant expansion into a feature length spin-off / remake. 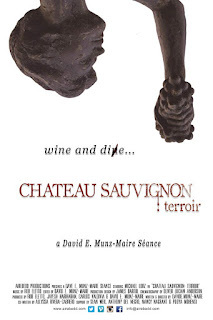 "Chateau Sauvignon: terroir" - Trailer from D. M. Night Maire on Vimeo.